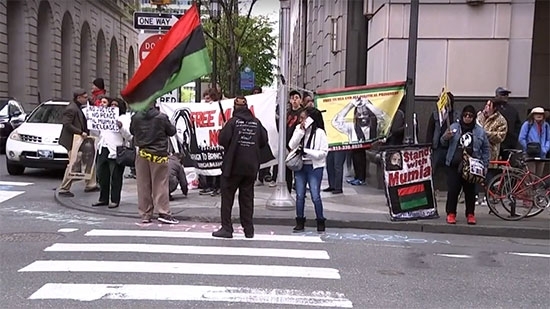 Convicted Philadelphia cop killer Mumia Abu-Jamal had a hearing in court today in hopes of overturning his previously denied conviction appeals. Abu-Jamal is currently serving a life sentence for the murder of Philadelphia Police Officer Daniel Faulkner. He was originally convicted and sentenced to death in 1982 but that sentence was reduced to life in prison in 2011. Abu-Jamal has used up all his traditional appeals. This hearing was a post-conviction relief act petition which is like an indirect appeal. The petition claims there was bias and conflict of interest during his appeal process. The judge who heard and denied those appeals was the senior assistant district attorney at the time of the original trial. Demonstrators stood outside the Criminal Justice Center and 13th and Filbert while the hearing was going on inside. The judge heard from both sides and will issue a ruling at a later day. New Jersey State Police say they believe that a teen driver of a car with a child in the backseat overdosed before it crashed last night in Camden County. It happened around 10 p.m. in the southbound lanes of I-76 just before I-295 in Gloucester City. The driver lost control and slammed into the median. Police say it appears both the 17-year-old female driver and passenger 19-year-old Richard Vanhise overdosed. A 7-year-old child was in the backseat at the time. No one was injured and no other vehicles were involved. The adults were unconscious when police arrived and were revived with Narcan. They were taken to Cooper University Hospital. The driver has been arrested and charged with driving under the influence. Vanhise was charged with drug possession. The incident is under investigation. A 17-year-old boy was shot in the eye this morning in Southwest Philadelphia. It happened around 7:15 a.m. inside a residence on the 5300 block of Lindbergh Boulevard. The teen was taken to Children's Hospital of Philadelphia in critical condition. Police say the victim's 16-year-old friend was trying to wake him up. When he didn't wake up the friend pointed a gun at him as 'a joke.' The 17-year-old then woke up, tried to push the gun away, and it went off. The friend remained at the scene. Philadelphia Police are still investigating.